The design for a pre-fabricated shopping centre model “screwed not glued” together – which can re-built elsewhere in the future - has taken out top honours at the Brickworks Living Building Challenge. The winning submission was the result of a collaboration between DWP|Suters, Aurecon, CJ Arms, Reedbed Technology, Eco Harvest, Biomimicry Australia, Future Food and Watpac. The Difference is Living provides a vision for the shopping centre of the future by comprehensively and creatively addressing key design principles, said Living Future Institute of Australia (LFIA) Vice- Chair Stephen Choi. “Among the strong calibre of entries, The Difference is Living is a worthy winner given the design’s strong alignment with the principles of the Living Building Challenge,” Mr Choi said. “The way the modular design came together in a functional, well-conceived way, to potentially be re- purposed elsewhere at the end of the centre’s life cycle, significantly reduces construction waste compared to a standard retail centre, and is not an approach normally considered to this extent. “Additionally, the winning design recognises and celebrates the innate connection between human beings and the natural elements that surround us, through its “Bush Tucker” interpretive green walls and approximately 3900sqm of billabong plantings, including over 2000sqm of vine growing structures along site boundaries. “The billabong idea is very strong. Billabongs are usually formed when the path of a creek or river changes, leaving the former branch with a dead end. Billabongs, reflecting the arid Australian climate in which these "dead rivers" are found, fill with water seasonally and are dry for a greater part of the year. “We were inundated with thought-provoking, progressive submissions that highlight the breadth of sustainability expertise that the competition tapped into, resulting in a diverse range of thinking underscored by a shared passion to re-imagine the retail sector. “We congratulate all award winners and entrants, and thank our sponsors, as the international design competition draws to a close for 2016,” Mr Choi said. The official awards ceremony for the Brickworks Living Building Challenge design competition was held last night at the Melbourne School of Design. The competition was coordinated by the LFIA, the local arm of the International Living Future Institute. 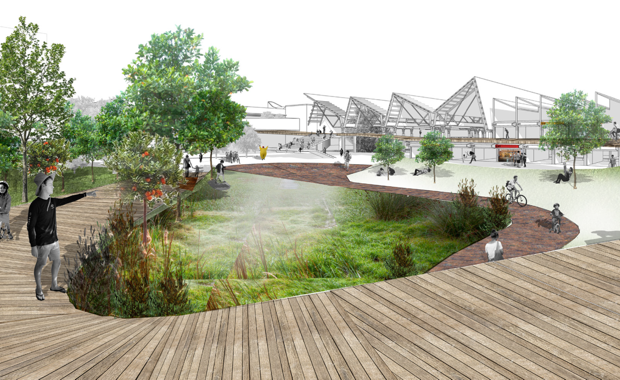 Frasers Property Australia was the Principal Partner and the company’s Brickworks shopping centre site in Melbourne was the subject of the competition. Also celebrated on the night was the winner of the Primary School Challenge, where local student Olivia Murley from Antonio Park Primary School won a new solar photovoltaic array to be installed at the school by market-leading Solgen Energy Group.